The project group ‚Defects and Elementary Processes‘ covers the range of crystal imperfections from point defects to interfaces and cracks. It aims to identify their relation to elementary processes that determine the material properties on larger length and time scales. Examples are the atomistic and continuum modelling of the influence of light elements on the mobility of dislocations and on the mechanical and fracture properties of interfaces. 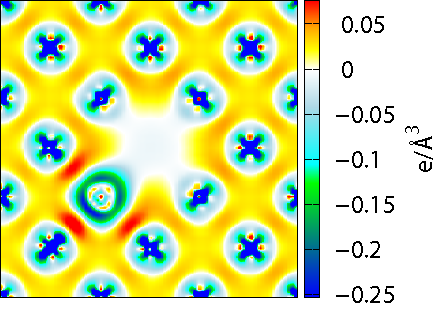 The solubility and diffusion of light elements at interfaces is investigated by atomistic modelling and experiment. The method developments in the project group are focussed on new methods for coupling simulations schemes. The investigated materials range from steels to intermetallics and superalloys for high-temperature applications. Charge density of interaction between Re and vacancy in Ni. Emission of dislocation loops during nanoindentation. Within the project group several models for atomistic interactions are employed. 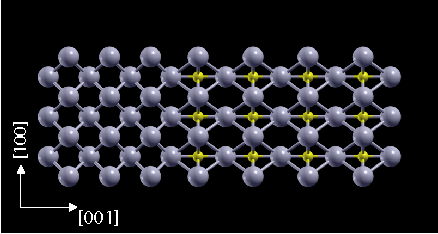 High throughput density-functional theory calculations are used to describe the electronic structure of the investigated systems. From these calculations tight-binding models are derived, that allow predictions of the stuctural stability. 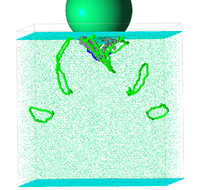 Further approximations yield bond-order potentials which can be used to simulate defects and finally (M)EAM type empirical potentials give access to large-scale atomistic simulations. The thus obtained results enter thermodynamic calculations (CALPHAD/SAPIENS) and kinetic Monte-Carlo simulations for extended time-scales as well as continuum methods for extended length-scales.